View other bears from Retired Charlie Bears. 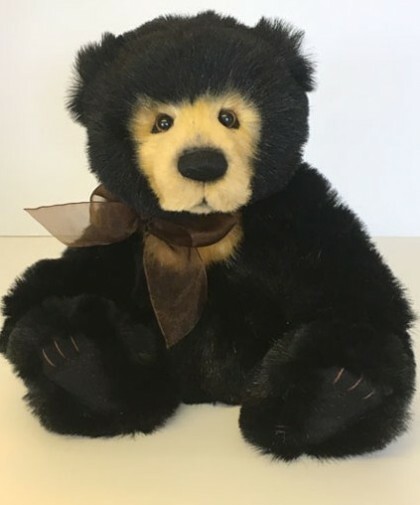 This traditional grizzly bear is part of the Anniversary Collection and is a smaller version of SETH, who was first launched in 2009 and is now very sought after!! He is based on a Sun bear, so has a sleek black coat, with a lighter muzzle and a bib-shaped golden patch on his chest, which legend says represents the sun. He has a hand embroidered nose, stitched paw pads and wears an organza bow. He is part of the Secret Collection, so only available to a few selected stockists and completes the set of other Anniversary grizzly bears, which included MALCOLM, SLOTHY JOE and DIESEL. Anniversary Seth is from the Charlie Bears Anniversary Plush Secret Collection. Sorry, this bear has retired and is no longer available. Have you seen the Charlie Bears Minimos?